Ceramics began in China 6,000 years ago during the New Stone Age, whose advent was marked, among other things, by the invention of pottery. The earliest earthenware was moulded by hand; the potter's wheel came much later. At the beginning the clay was fired at a temperature of some 500-600 c. Painted pottery began to be known during the period of Yangshao and Longshan cultures. The large legion of terra-cotta soldiers and horses of the Qin Dynasty (221- 207 B.C. ), discovered in Shaanxi Province in 1974, are eloquent proof of the high skills in kiln-firing and sculpture attained at that early age. The art of pottery reached another peak of development in the Tang Dynasty (618 907 A. D.), as evidenced by the renowned "tri-coloured glaze." On the basis of pottery developed porcelain, which emerged in China, homeland of the art, 3,000 years ago during the Shang Dynasty. From the remains of that period at Sanligang of Zhengzhou and Xiaotun of Anyang (both in Henan Province) and at Wucheng Village of Qingjiang County, Jiangxi Province vessels of blue-glazed ware have been unearthed. Upon examination, they proved to have been made of kaolin and fired and. vitrified at the high temperature of 1,200 C. Their surface is coated with a glaze, whose chemical composition is already very close to that of their bodies. Certain porcelains of the Song (960-1279) and Ming (1368 1644) dynasties were already celadon, though at its early stages. Chinese ceramics became known to the world at large from the Tang Dynasty so much that the word "china" became the name of porcelain. Chinese porcelain, together with Chinese tea and silk flowed through the Silk Road and other land and sea routes to foreign countries. Jingdezhen in southern China became a principal centre of the porcelain industry during the Song Dynasty. Dubbed the "Porcelain Metropolis," it still boasts important remains of ancient workshops and kilns. A significant archaeological find was made when a porcelain kiln dating back to the Eastern Han Dynasty (25- 220 A.D.) was brought to light a few years ago at Xiaoxiantan in Shangyu County, Zhejiang Province. This is the earliest porcelain-producing site ever discovered in China, and in the world as a whole. Rapid progress has been made in the industry since the founding of New China by inheriting from, and improving upon, the past. Ceramics are now produced with renovated techniques and in ever-growing varieties in many localities, to the welcome of customers at home and abroad. In China, porcelain enjoys a very long history. During the Shang and Zhou dynasties, ancient earthen wares were found in the middle and lower reaches of the Yangtze River and Yellow River. Actual porcelain wares only starts during the Han Dynasty. As times progress, the making of porcelain ware improves with new techniques and creativities, resulting in having different styles from one period to another period. During the Han Dynasty, celadon and black porcelain were mainly produced. Celadon is a type of grayish-green glaze, which is like the colour of jade. Developments in the productions of celadon porcelain continue to carry on into the later dynasties. In the late Tang Dynasty, with the achievement of high technical method, celadon porcelain was produced in a large scale. While celadon porcelain was at its peak, at the same time, pure white porcelain known as Xing ware, because it was mainly produced at Xing Kiln in the Province of Hubei. Its porcelain wares when been tapped gives out sounds like as if a sound from a musical instrument. In the history of Chinese porcelain, the porcelain wares of the Song Dynasty can be classified as a classic example of porcelain art in the entire world. Classic, because Song porcelains have achieved an excellent combination of shape, glaze and decoration to it's ware. This is mainly due to the achievement made by the potters during the Song Dynasty, for having acquired a high command of skill in the area of making pots, innovative firing techniques and glaze making. Many famous kilns were found at different areas during the Song Dynasty. Among all the famous kilns, the Ru Kiln, Jun Kiln, Guan Kiln, Ge Kiln and the Ding Kiln are the top five most famous kilns. Creamy porcelain wares are produced at Ru Kiln. The red of the rosy porcelain wares produced at Jun Kiln are like the brilliant sunset glow. Ge Kiln specializes in producing artificial crackle porcelain wares. Among this three-mentioned kiln's ware, Ru's wares is the most famous of them. It was said that a Ru ware are solely produced for the imperial court. Ru wares is fine and delicate, it uses a special glaze with carnelian added to it. Basically, four kinds of colour glaze are been used in Ru wares; they are azure, sapphire, moon white and turquoise. The firing temperature and the glaze prescription are very difficult to control. With only twenty years of production, Ru wares are very rare. So rare, that up to date only seventy pieces of such ware can be found in the whole world. Therefore, we can say that the techniques applied in the production of porcelain wares during the Song Dynasty have reached its greatest height. During the Yuan Dynasty, the porcelain industry continued with its rapid development. Blue and white porcelain of the Tang and Song dynasties, continues into the Yuan Dynasty, by using the traditional techniques maybe with some difference in design like painting are being applied. Firstly, the blue and white porcelain ware was painted with a strong blue under the transparent glaze. This resulted in the colour been perfectly protected by the layer of hard glaze, enabling it to be lasting and well preserved. Among those kilns at that time, the kilns in Jingdezhen has made a technical breakthrough by remodeling the material combination and make improvement to the firing temperature, hence facilitated the production of large porcelain wares. Secondly, in Yuan Blue and White wares we may find some uncustomary Chinese design, it is full of decoration, brightly coloured together with combination of some uncustomary Chinese shape and decorative Chinese motifs. During the Yuan Dynasty, under glaze-blue and the under glaze-red was used for decoration. The decoration is very pictorial. Thirdly, before the Yuan Dynasty there was very little colour choice. Great achievement was made in the produce of coloured glaze. In the Ming Dynasty, blue and white porcelain wares are the chief porcelain products. During the reign of Emperor Yongle, Xuande and Chenghua, blue and white porcelain ware enters into its golden era. Emperor Yongle and Xuande reigns' porcelain has features of delicate and thick glaze, various design and pattern, and with plenty of model. As for those porcelain wares under Emperor Chenghua reigns, it is also delicate but lighter in colour with Chinese ink and washed painting incorporated onto it. During the late Ming Dynasty, under the reigns of Emperor Jiajing, Longqing and Wanli, the blue and white porcelain received great popularity. 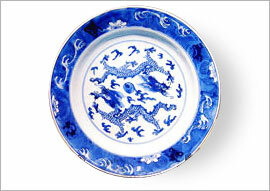 In the Qing Dynasty, the blue and white porcelain made great advances and created a worldwide interest. Among the Qing porcelain wares, those produced under the reigns of Emperor Kangxi, Yongzheng and Qianlong are the most famous. Jingdezhen, formerly spelt Ching The Chen and known as the "Ceramics Metropolis" of China, is a synonym for Chinese porcelain. Variably called Xinping or Changnanzhen in history, it is situated in the northeastern part of Jiangxi province in a small basin rich in fine kaolin, hemmed in by mountains which keep it supplied with firewood from their conifers. People there began to produce ceramics as early as 1,800 years ago in the Eastern Han Dynasty. In the Jingde Period(1004-1007), emperor Zhenzong of Song Dynasty decreed that Changnanzhen should produce the porcelain used by the imperial court, with each inscribed at the bottom "made in the reign of Jingde. : From then on people began to call all chinaware bearing such in scriptions "porcelain of Jingdezhen". The leading center of the porcelain industry, Jingdezhen has been put under state protection also as an important historical city. With 133 ancient buildings and cultural sites, it is a tourist town attracting large numbers of visitors from home and abroad. Cloisonne is a unique art form that originated in Beijing during the Yuan Dynasty (1271 - 1368). Cloisonne, in which China excels, is known as jingtailan in the country. It first appeared toward the end of the Yuan Dynasty in the mid-14th century, flourished and reached its peak of development during the reign of the Ming Emperor jingtai(1450-1457). And as the objects were mostly in blue(lan) colour, cloisonné came to be called by its present name Jingtailan. A Jingtailan article has a copper body. The design on it is formed by copper wire stuck on with a vegetable glue. Coloured enamel is filled in with different colours kep apart by the wire strips. After being fired four or five times in a kiln, the workpiece is polished and gilded into a colourful and luxtrous work of art. During the Ming Dynasty(1368-1644), cloisonneware was mainly supplied for use in the imperial palace, in the form of incense-burners, vases, jars, boxes and candlesticks-all in imitation of antique porcelain and bronze. Present-day production, with Beijing as the leading center,stresses the adding of ornamental beauty to things that are useful. The artifacts include vases, plates, jars,boxes, tea sets, lamps, lanterns, tables, stools, drinking vessels and small articles for the desk. A pair of big cloisonné horses have been made in recent years, each measuring 2.1 metres high and 2.4 metres long, and weighing about 700 kilograms. They took eight months to finish, involving the labour of hundreds of workers and 60 tons of coal for the firing. They represent the largest object even made in cloisonné in the 500 years since the art was born. Cloisonne ware bears on the surface vitreous enamal which, like porcelain, is hard but brittle, so it must not be knocked against anything hard. To remove dust from it, it should be whisked lightly with a soft cloth. Avoid heavy wiping with a wet cloth, for this might eventually wear off the gilding. Cloisonne manufacture is comprehensive and sophisticated, combining the techniques of making bronze and porcelain ware, as well as those of traditional painting and sculpture: click to view more about Cloisonne manufacturing. Celadon, a famous type of ancient Chinese stoneware, came into being during the period of the Five Dynasties(907-960). It is characterized by simple but refined shapes, jade-like glaze, solid substance and a distinctive style. As the celadonware produced in Longquan County. Zhejiang Province, is most valued, so it is also generally called Longquan qingci. Its Chinese name, qingci, means "greenish porcelain". Why then is it known in the West as 'celadon". Celadon was the hero of the French writer Honore Urfe's romance L' Astree(1610) the lover of the heroine Astree. He was represented as a young man in green and his dress became all the rage in Europe. And it was just about this time that the Chinese Qingci made its debut in Paris and won acclaim. People compared its colour to Celadon's suit and started to call the porcelain " celadon", a name which has stuck and spread to other countries. Now, new products of Longquan qingci have been developed to radiate with fresh luster; they include eggshell china and underglazed painting.